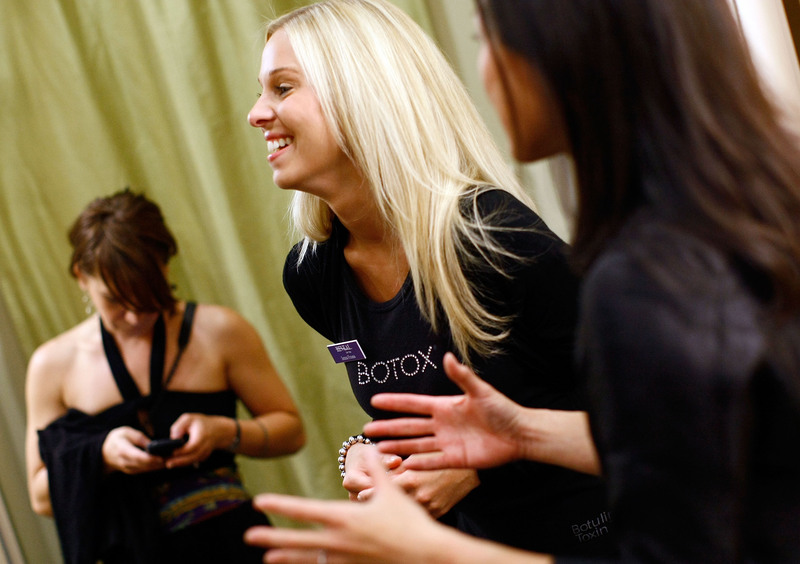 Botox is one of those beauty treatments that everyone has an opinion on. You’re either out and proud with your crinkle-free face, or you’re all aboard the anti-freeze brigade. Me? I’m in the don’t-knock-it-til-you-need-it camp. At 28, I’m probably edging closer to the time when I will feel like I could benefit from an injectible or two, but turns out there’s a whole other raft of Botox uses that don’t have anything to do with my swiftly encroaching elevens. Namely: sweat busting. “Botox is FDA-approved for excessive armpit sweating," Sherry Sanvictores, of the Dr. Cassileith practice in Beverly Hills, says. "It’s something that for most patients antiperspirant or even prescription grade antiperspirant doesn’t do the job.” She explains to me that Botox minimizes and blocks out the body’s sweat glands, anywhere from six months to one year. For some people, it’s about keeping your gown dry on your wedding day. For 33 percent of the population, it’s about keeping dry e-v-e-r-y day of your life. That's right — excess sweating is a medical condition, and I count myself among the afflicted. Hyperhidrosis is the official term for those who sweat constantly out of the underarms, hands, feet, groin, and face. You know if you are a sufferer — you sweat in everyday situations; when you are stressed or anxious, in a new situation, or when meeting new people. And you ruin all of your clothes. I’ve always taken my sweating for granted. I thought it was normal that during a work meeting, even if I felt like I was in control, my underarms would be giving me away. Even in the depths of below freezing winter I’d perspire underneath my winter coat. It was only recently that I came to the realization that it wasn’t just a fact of human life, and there was an answer — Botox. “Some people just more sweaty than others,” Sanvictores says. I’m not scared of needles, but the idea of injecting a solution into my armpits is admittedly a little terrifying. Still, the prospect of a year without ruining every white T-shirt is too good to pass up, so I make an appointment with Sanvictores to give it a go. “We’re not cutting sweat glands with this treatment, Botox simply blocks the nerves from reaching the sweat glands — it decreases the chemical reaction between the two,” she says. She starts by drawing a diamond shape, encompassing all of my armpit, and then dotting points about a centimeter (slightly more than half an inch) apart. “Some people know they sweat in certain areas of the armpit so we’ll concentrate on that, while the average patient just knows they sweat everywhere,” Sanvictores says. For the average patient, a whole vial of 100 units is generally required — 50 units for each armpit. “Unit dosing is tied to longevity, so if you do less than the clinical amount, it may not last as long,” Sanvictores says. She minimizes the pain by applying a topical numbing cream to both armpits before the procedure and then when we get started, using an air machine to blow cool air onto the area to further decrease sensitivity. I don’t lose all sensation in my armpits when she starts the injections, but it’s not the pain I expected. There’s a slight prick when the needles hit your skin surface, but it’s only mild discomfort, at worst. All up, both armpits are done in ten minutes. She works swiftly and accurately, and I’m pleasantly surprised that I haven’t been mentally scarred by this experience. I could do this again. “Botox is probably the only cosmetic procedure that has a 95% patient satisfaction rate, and about three million Americans get Botox every year," Sanvictores says. “It has so much safety data and has been proven for safety, efficacy and predictability.” She tells me I might have bruising in the areas for a day or so, but I don’t have any of that, just minor redness. One of my biggest fears with trying this procedure was having the sweat start presenting itself in other areas of my body — like my hands or feet. Sanvictores assures me that historically, this isn’t a problem, and true to form, I don’t see any other compensatory sweating. My only tip, having had it done? It’s changed my life.